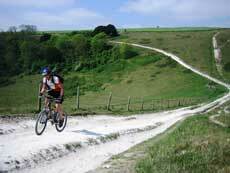 The South Downs Way is one of the most popular "off road" cycling routes in the UK. The whole route can be completed in 4 days or less depending on your fitness level and the views and places of interest are wonderful. Lewes is an ideal resting point for cyclists who want a good nights sleep and some local entertainment and food. To complete the route you will need a well maintained mountain bike that can also be hired in the town. If you don't want to do the whole route you could maybe start at Lewes and finish in sunny Eastbourne. Either way we can offer you a comfy B&B in Lewes to recharge for the next days peddling. If you want to cycle locally there are great route that follows the river Ouse and various "on road" country lanes, interconnecting small english villages and towns. There are also alternative "off road" routes for the adrenaline junkies out there. The route from Lewes to Eastbourne is probably the most interesting part of the South Downs Way and is highly recommended for all levels. You will need a mountain bike or hybrid to complete the route that is well sign posted although its quite easy to figure out which direction you are going in. Unfortunately there are no shops in Lewes where you can rent a bike, but there are companies that will drop off and pick up around the brighton area. The bikes cost around £20 a day to hire. Please contact Orchard Bed & Breakfast of Lewes for more information.